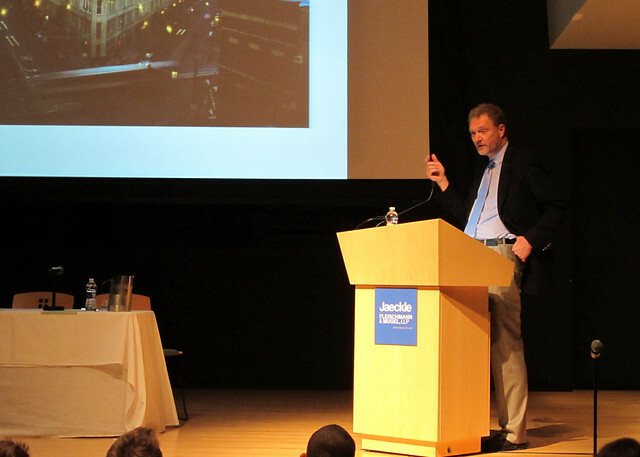 John Norquist, former Mayor of Milwaukee and President of the Congress for the New Urbanism, was in Buffalo recently and spoke at the Burchfield Penny Art Center. The podcast of Norquist's remarks - Part I - runs about an hour after the jump. The panel discussion that followed was led by Kate Foster - Director of UB's Institute for Local Governance and Regional Growth and featured two of Buffalo's most progressively minded urban developers: Carl Montante and Rocco Termini. They were joined by Jacques Gourguechon, a Principal of Camiros the firm retained by the City of Buffalo to undertake the complete over-haul of the city's antiquated 1951 zoning ordinance. The podcast of the morning's panel discussion and Q&A - Part II - runs about an hour, after the jump. The website of the Buffalo Green Code, the title Mayor Byron Brown has given the zoning re-write effort, was formally unveiled by Jacques Gourguechon during the forum. 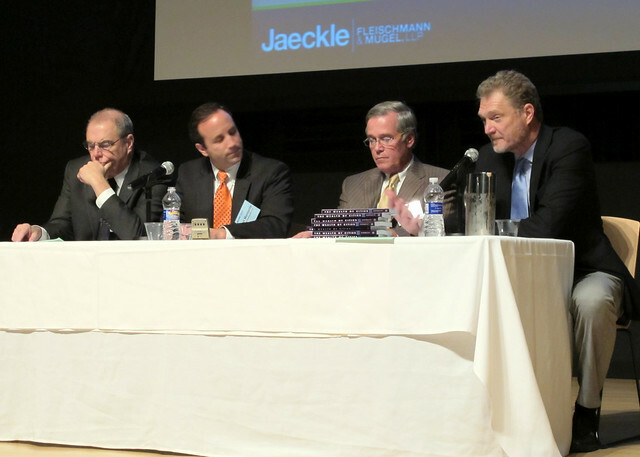 The event was sponsored by Jaeckle, Fleishman & Muegel LLP and was part of their annual WNY Economic & Land Development Forum. The following story about St. Gerard's Church appeared on ABC News this past Sunday. Built in 1911, this iconic neighborhood heritage structure is modeled after the Basilica of Saint Paul Outside the Walls, and is located at the corner of Bailey and East Delevan on Buffalo's East Side (google map). Rev. David Dye and his congregation plan to move St. Gerard's to Norcross, GA. They've included a catalog of naming opportunities on their site to help raise the $16.5m necessary for the demolition/move/re-building of one of Buffalo's architectural treasurers. With increased national exposure and Buffalo's largest preservation organization - PBN's statement about St. Gerard's - signing off on the plan, the suburban Atlanta congregation may get their way. The text of ABC's Sunday story is available here. See - The Plundering of Buffalo with links to additional pics and writing about St. Gerard's including last February's USA Today article about moving St. Gerard's to suburban Atlanta. Update - here's the full text of the Common Council resolution - sponsored by Buffalo Common Council President David Franczyk - designed to stop the plundering of the city's architectural resources. The resolution was adopted by the Common Council and is currently being conformed into law by the City's Law Department. According to Council staff it is expected to become law by year's end.